There is a line in the Globe’s cheap eats review that says, “they love it because it’s just like their Nonna’s house,” so I was expecting a more rustic, mom-and-pop feel to the restaurant. When Steve and I arrived at the packed Moody Street restaurant my first thought was, “Wow, Nonna must live in a chain restaurant in the mall.” It was too slick with the large HD TVs airing the college football games and trendy red lighting under the bar. I am glad I made a reservation – the wait was 30-45 minutes for a table for 2. Unfortunately, they sat us right by the door where we were assaulted by a chilly breeze every time someone went in or out. We started with the panzanella ($10), which was a decent arugula salad with roasted red pepper, cucumber, tomato and topped with really tasty fried chickpeas. I thought the salad was over-dressed (Steve did not) but the issue I really took umbrage with was calling it a panzanella. Panzanella is a classic Tuscan salad, featuring stale bread soaked in tomato juices. This salad only had a handful of dry croutons. Under the heading “Neapolitan pizza” they offer 6 round and 6 oblong ones. 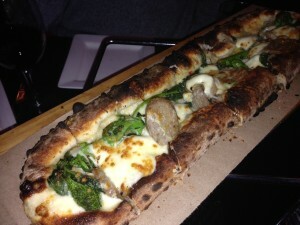 I wish I had asked about the difference, as the oblong rapini and sausage pizza ($16) we shared was more flatbread than pizza. That said, I thought the crust was good. It had good smoky charred flavor from the wood fire and decent chew. The toppings were good, but sparse. 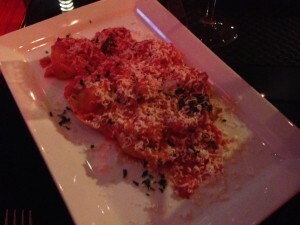 We also shared the chicken cappelletti ($16), which is another way to say tortellini. The filling was dry – it reminded me of a bad frozen chicken meatball. The homemade pasta it was encased in was too thick. Our server was busy, but did not ignore us. I enjoyed the bread, which triangles of their pizza dough with basil oil. My cider cocktail was delicious, Steve thought the wine was “ok,” I don’t imagine I’ll be back, it’s too California Pizza Kitchen for my taste.